When what we do comes from our heart, we do it with sincerity, integrity and love without thoughts of practical benefits or calculation. The heart energy is the higher octave of the solar-plexus energy, and matters of the heart do not tolerate even a hint of guile. When another person is heartless, this affects us more than when someoner uns around like a headless chicken or doesn’t have both feet on the ground. The heart represents natural authority. If we express this in our life, joy and friendliness can be revealed in a natural way. If the heart does not have any inner powerfulness, we must exercise power and this leads to cold-heartedness. The focus of the sixth volume of the Organ – Conflict – Cure series is the harmonic order of the heart and circulation, as well as the sounds and rhythms of the blood circulation. It puts a new light on frequent cardiovascular diseases such as arteriosclerosis, heart attack, high blood pressure, disorders of heart rhythm, cardiac insufficiency and varicose veins and explores the groundbreaking findings of cardiology such as the conflicts of the heart and circulation, as well as their solutions. 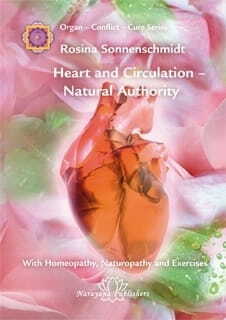 Rosina Sonnenschmidt describes the use of proven homeopathic remedies such as Naja, Kalmia, Latrodectus, Convallaria, Crataegus, Cactus, Spigelia, Digitalis and Strophanthus. She also explains various naturopathic treatments such as rhythmic exercises, deacidification, a therapeutic diet with delicious recipes and well-established heart herbs and remedies according to St. Hildegard. This volume also has a special character due to the consideration of the heart theme from the perspective of alchemy and ancient European symbolism. This book comes from the heart and will touch the heart of the reader.